Scandinavia is full of wonders. We invite you to witness one of the most spectacular ones in Finland, the Northern Lights. Seeing this enchanting dance of colorful lights in the night sky is an experience second to none. And when paired with a wide range of authentic local activities like dog sledding, Northern lights tours in Finland are the best option for your winter getaway. Welcome to the glorious capital of Finland - Helsinki! Upon arrival your driver meets you at the airport and transfers you to your modern well-designed hotel for check-in. The rest of the day is free, so you can relax in your room, have dinner in a local restaurant or start exploring the nearby attractions. Following breakfast at your hotel, your private guide takes you on a wonderful 4-hour walking tour to show you the best Helsinki ​can offer. During the tour, you walk through the vivid Central Harbor and Market Square, explore the charming Old Town, visit the famous Rock Church and take a short tram ride. After the tour you return to your hotel. The rest of the day is free, so you can continue exploring Helsinki on your own, or take one of our optional tours. Optional tour #1: Modern Helsinki (duration 4 hours). The tour starts in a popular Design district from the exploration of the famous Esplanade - an absolutely must-visit place that has plenty of unique stores available only in Helsinki. Optional tour #2: Authentic Finland (duration 4 hours). During the tour you visit a typical Finnish farm where you will witness the daily routine of contemporary Finnish farmers and see the herds of various animals. After breakfast you check out from your hotel and continue your journey to new adventures. Your private driver transfers you to the airport for a quick flight to the Mortherland of Santa Claus - Rovaniemi (tickets are included). 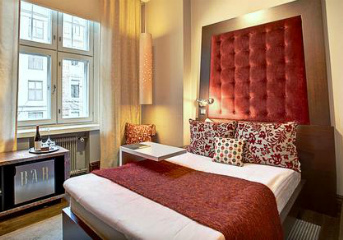 Upon arrival you are transferred to your newly opened boutique hotel in the center of Rovaniemi. After check-in you have free time to start exploring the nearby attractions on your own, take a walk around the charming city streets, or have a good rest to prepare for an exciting program that awaits you tomorrow. Today you enjoy a fantastic group tour during which you visit famous Lapland sights and try exciting northern activities. This day starts with a 1-hour snowmobile safari to a reindeer farm where you meet traditionally dressed people, learn more about reindeer husbandry and Lappish culture and enjoy a short reindeer sleigh and husky ride. Note: Due to unsuitable weather conditions (e.g. there is no snow or it is raining), a snowmobile ride and reindeer sleigh will be replaced with a visit to the Arktikum Museum. After the farm you continue your trip to Santa Claus Village where you have some time to visit the Snowman World and attend a real ice bar in it. You can also buy some traditional Finnish souvenirs and send postcards with special Arctic Circle stamp from Santa Claus main post office. Please note: Snowman World is open from beginning of December to end of March. After the tour you are transferred back to the hotel. Following breakfast you check out from your hotel and your driver takes you to the igloo village located away from the city lights. The unique accommodation allows watching the Northern Lights and starry skies in warmth and comfort. After check-in, you are welcomed to enjoy the Nordic beauty of the surrounding area on your own. Note: the indicated glass igloo accommodation is an example of the properties used for our tours, and might be updated to similar glass igloo properties based on availability. After breakfast you check out from your hotel and your driver takes you to your final destination - the authentic Inari region known as the center of Sami culture. Upon arrival, you leave your luggage at your centrally located hotel and have a 1-hour guided tour at the Sami Museum and Nature Center that provides you with a deep insight into the culture, traditions, and nature of Northern Lapland. You then have two additional hours to explore this museum on your own. Optional lunch: We recommend you to have lunch in the unique Sarrit museum restaurant that serves delicious dishes made of the best products the North has to offer. In the afternoon your driver picks you up at the Sami Museum and transfers you to a remote location by Lake Muddus where you have a group visit to a local Sami Family. In 3 hours you are introduced to its reindeer herd, that you can pet and feed, while the hostess tells you about the importance of reindeer for Sami people. In the warmth of their house, you find out about the fascinating process of creating traditional Sami fur boots of reindeer hide and learn what life is really like in the far north. After this exotic experience you return to your hotel for check-in and have the rest of the day free. Note: Early check-in is not included. Today is the final day of your exciting Northern Lights adventure. After breakfast you check out from the hotel and your driver transfers you to the Ivalo airport for your flight back to Helsinki. We hope you enjoyed your Finland experience and will plan your next trips with Firebird Tours! *Note: All the group tours are subject to weather conditions and can be replaced with possible alternatives. **Note: Please pay attention that Snowman World is available only from December. Scandinavian climate is unpredictable and weather can be quite harsh. Bringing some warm clothes is a must. The trip was fantastic. We enjoyed everything about it and can't wait to start planning our next one. I would like to thank you for helping us plan it, rearrange things for us and bring it all together. It was the best holiday we have ever had. Thank you again.